United Nations Framework Convention on Climate Inaction? 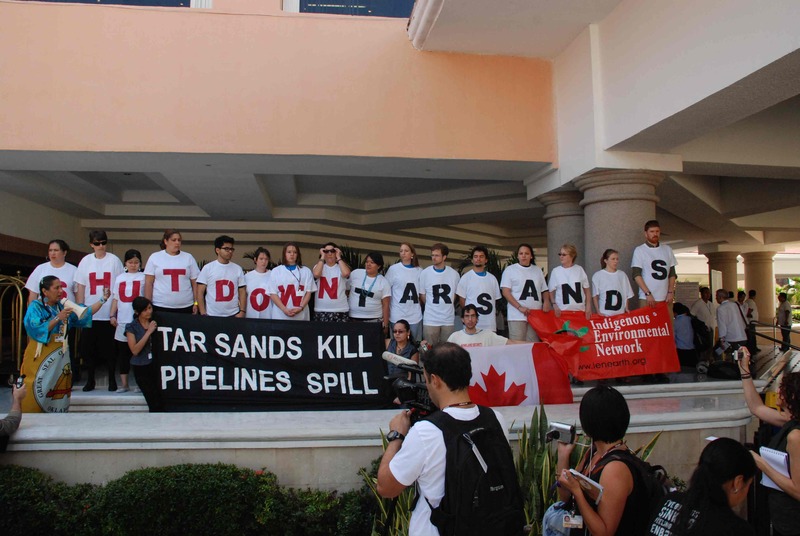 “Get to Work!” – This language has been used by many NGOs from the global north here in Cancun, trying to confront the many governments, especially the “Umbrella Group”, including the US, Australia, and Canada, who are taking virtually no action on climate change. However, this is only half of the story, and the “get to work” language doesn’t describe all that’s going on. For example, one of the conference’s focal points is REDD+ (Reducing Emissions from Deforestation and Forest Degradation). This is one of many “offset” schemes transferring money to mostly nations of the global south, for keeping forests in tact, in exchange for rich companies to continue polluting as usual. In practice, this often means the displacement of indigenous peoples who rely on forests for their survival or allowing polluting projects to be “offset” by monocrop forests that are disconnected from the rest of the region’s ecology. Moreover, the financing for this and other adaptation funds being proposed (which nations such as Canada will likely take out of existing aid funds) is being distributed through the World Bank, an undemocratic and controversial international institution that is in charge of “developing” poor countries as it sees fit. Meaning that instead of going to local projects that keep the power in the hands of communities, this money goes towards World Bank projects, which have included mega-dams and other destructive projects that have displaced millions. Yes, we need our governments to get to work to confront ever exacerbating human-induced climate change, but first we need them to stop creating more mechanisms to undermine communities while their friends continue polluting. The one proposal that went to the root of the problem, by addressing unsustainable patterns of production and consumption, while recognizing that countries need to produce goods and services to meet the basic needs of its population, was from the “World People’s Conference on Climate Change” and put forward by Bolivia. However, earlier this week it was stricken from the UN Climate Conference’s negotiating text. By only watching what’s happening on the inside of negotiations, it’s impossible to be optimistic. However, those who have real solutions and are working to confront climate change and injustice are starting to make their presence known. This morning, the Indigenous Environmental Network did a powerful action calling for tar sands projects and pipelines to be stopped and replaced with community-based solutions. Via Campesina Caravans, full of primarily peasants from Latin America, and representatives from civil society organisations such as the Council of Canadians, will soon be arriving in Cancun. They will be resisting false solutions, while bringing voices from peoples with real solutions and that have been living in harmony with the rest of ecology for thousands of years. Here in Cancun, governments are getting to work, just in the wrong direction. But just as I was ready to lose all hope, the real solutions are starting to come.